The total number of GSM subscribers is at 555 million, up from 540.37 million in January, according to the Cellular Operators Association of India (COAI). A report on India's GSM userbase is available for download from COAI here. India's GSM mobile user base saw an addition of 14.7 million users in February. Bharti Airtel added 3.2 million subscribers and now has 159 million. Vodafone has 130.9 million subscribers. 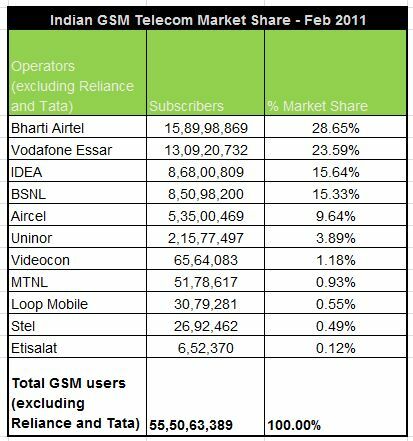 BSNL added 1.5 million subscribers in the month and a total subscriber base of 85 million and Idea Cellular has 86.8 million subscribers as of February 2011.